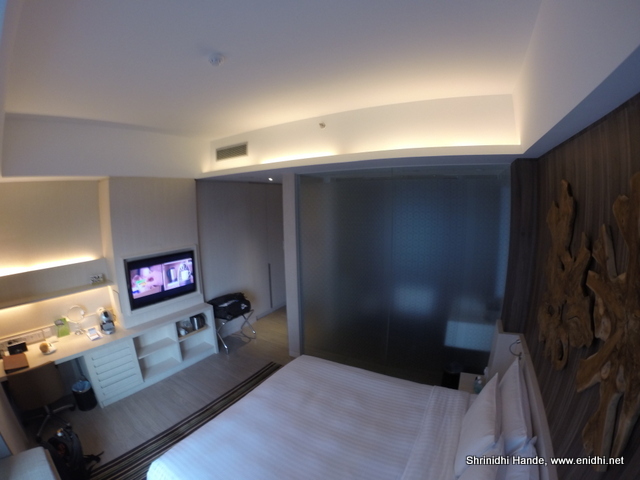 We spent 4 nights/5 days at Oasia hotel, Novena, Singapore. This post is my review of the hotel. As we entered the hotel, huge vertical lobby greeted us. Oasia hotel, like most hotels in Singapore is a high rise building with over 25 floors. Top floor has 4 suites, which we were told fully occupied, hence could not be shown to us (Suits cost around 430 SGD per night). Floor 20-24 has Club Class rooms- Club class rooms obviously cost extra but gets a host of extra benefits like exclusive pool and café, airport lounge access, early check in, late check out facility etc. Club rooms also have a uniquely designed rooms with dual access bathrooms, better equipment etc. Club rooms cost about 80 SGD per day extra compared to Superior rooms, but I think the extra value is totally worth it. We were given a brief tour of the hotel where we could check out different kind of rooms. I have included few such photos with explanation where possible. Rest of the review is based on the Deluxe room in which we stayed. Above: View of Club Class room at Oasia Hotel and an exclusive pool for Club guests. There is a single button to switch off all lights- which is very convenient while going to bed. No need to switch off different switches. Also this button doesn’t cut supply to power outlets, where you might have kept stuff for charging. All rooms are in single tower- no dual tower and access issues as I had faced in Peninsula Excelsior. Novena MRT station is walkable from Oasia. You can take MRT to most of the attractions/destinations for fraction of a cost compared to hailing a taxi. Going to central business district, say City Hall MRT station costs about SGD 1.7 by MRT and takes less than 20 min. So I always recommend booking a hotel close to MRT station. 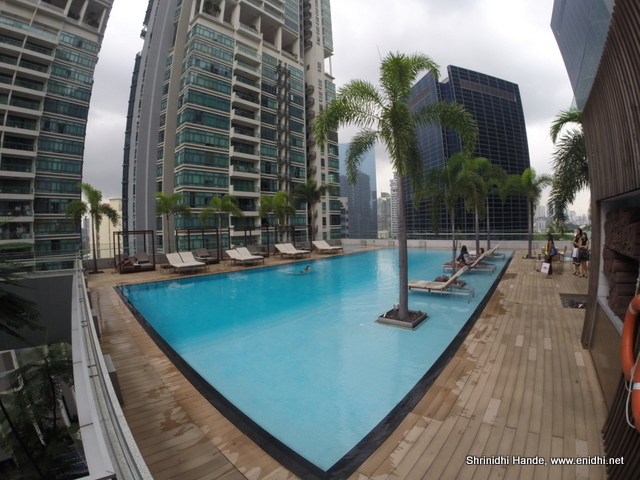 Pool at Level 8, with a small rooftop garden is nice. There's a weighing scale, iron box and table,disposable footwear and bathing gown. All nice essential accessories included. Elevators are pretty quick, we didn’t have to wait for more than a few minutes all the time. Each room gets different kind of art work. Bathroom kit involves a tiny toothpaste. But the mouth of this toothpaste is sealed. I couldn’t figure out how to open it. (toothpastes in India aren’t sealed) There were no tools nearby and it won’t open with hand. I used the toothpaste I had carried with me. I would have preferred 4 distinct colours for the bath liquids. Shower gel and Shampoo are of same colour. Little inconvenient to read and pick the ride one while bathing is in progress. First 3 days I didn’t touch the big fruit they’d kept in the room. It would have been nice if the staff realize that I am not liking the fruit and keep some different fruit. But no such thing was done. On last day, there was no fruit. Shower chamber feels a bit congested- can’t move arms around freely. Room numbers are not in sequence. Even numbered rooms are on one side, odd numbered ones are on the other. For a moment I thought my room was missing. We had to give a security deposit of about SGD 50 per day. For 5 days we were asked to deposit 250 SGD in cash or via card. I wasn’t keen to use card and had some cash. I offered SGD 150 which I had handy and they accepted it (Good thing). On last day morning, I asked if I can have 100 SGD out of 150 SGD back, so that I can use it for some shopping (I had no plans to shop, was just testing if they are flexible to accommodate my request). Request declined. Refund only after checkout, no partial refund or early refund possible. There was only one chair in the room. Second one would have been nice. Mini bar was empty- not that I cared or wanted to have something from it. I am sure it will be loaded on request. Oasia had a father's day special offer where father dines free if there are three fully paying guests. Essentially translates to 25% discount, but family of three can't avail this offer. No proper sofas with backrest in lobby area. Waiting there is not very convenient without support for the back. I couldn’t check the spa. Check in and check out process was pretty smooth. Restaurant at Level 1 has nice wooden theme walls. Different kind of wood/patterns don the walls. Overall our stay was nice. Far East Hospitality has a mall and few other business as well in Singapore. A second Oasia hotel is under construction near China town and is expected to be operational sometime in 2016/17. As part of SG50, Oasia is offering upto 35% off on their regular tariff. Superior rooms are available for SGD 220 per night onwards. Do check hotel website for availability and deals. I realized that room rents in Singapore have gone up by about 25% over past three years. 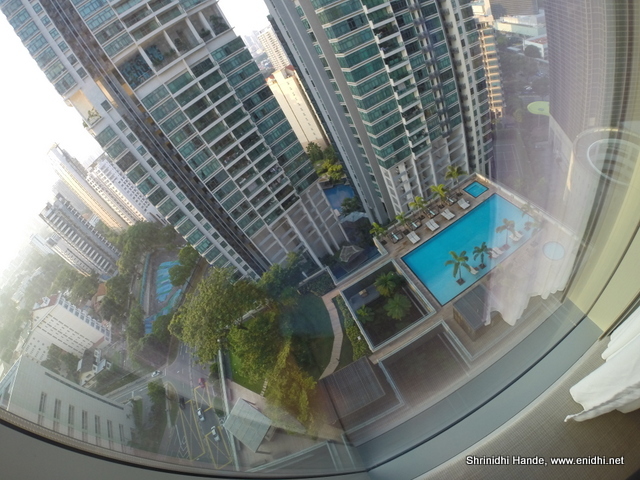 In 2012, Marina Bay Sands rooms were starting at SGD 249. 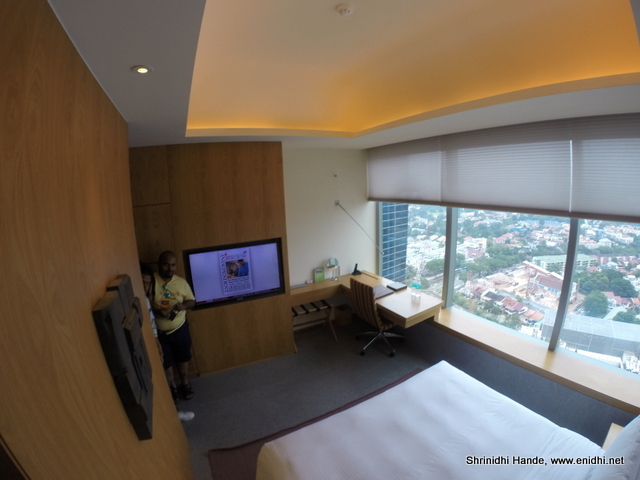 Today MBS rooms cost SGD 379 onwards. Land is the most precious and high demand asset in Singapore and it doesn't get any cheaper over time. So I guess there isn't much respite on this front. If you're sitting on the fence trying to decide whether to go to Singapore this year or next, I think you should make use of SG50 discounts and make a trip now. Cost will only escalate over time. Love the interiors of the hotel and the view from the room is also awesome , wondering why there is one patch in the group selfie in the lift ... was it intentional ? Most toothpastes / ointments that are sealed have a pointed end inside the cap that can be used to puncture the tube. Didn't know that.If I had a compulsion I would have probably studied more and found it out,since I had my own toothpaste I didn't put much effort.